$25 fee for wire transfer withdrawals and also for wire transfer deposits under $500. $100 minimum withdrawal. Global Trader 365 is a binary options website owned by a company with the same name, and which operates in the British Virgin Islands. The company is not regulated, but offered us unparalleled customer service and transparency when we checked out their website today in preparation for writing this review. We are so impressed by their service that they instantly became one of our highest recommended choices. They offer their site services to customers in the USA and worldwide, and handle their billing in conjunction with ChargeXP Investments. Their platform is SpotOption. When you open an account and make your first deposit, you need to deposit $200 or equivalent. You can trade in US Dollars, British Pounds, or Euros. Deposit methods include credit card, wire transfer, and CashU. There is a standard $25 fee for wire transfer withdrawals. If you use wire transfer to deposit, you must deposit $500 or more not to be charged the same fee. There is unfortunately a minimum withdrawal limit of $100, but otherwise we have no complaints. Global Trader 365 offers referral bonuses and match bonuses on deposits. Match bonuses kick in when you deposit $300, for which you can receive a 30% bonus. Bonuses increase with higher deposit amounts. If you deposit $1000, you will receive a 50% bonus and so on. Global Trader 365 offers a demo account! Not only that, but they make it easy to find. It’s at the bottom of the page in the site links on the left. There you’ll find the instructions for getting started. First you have to register on the site, and then you just need to email info@globaltrader365.com and request virtual funding for your account. There are no limitations mentioned in conjunction with the demo account, and in light of the customer service we encountered today, we’re guessing you can demo as long as you want until you’re ready to trade live. 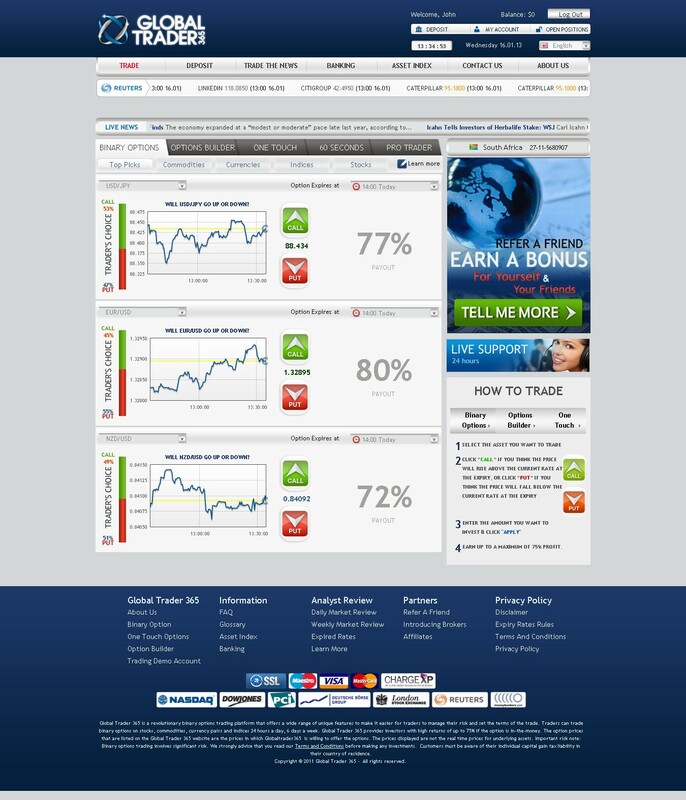 There are 83 different currencies, commodities, stocks, and indices you can trade on this site. You can trade High/Low, One Touch or 60 Seconds trades, or use Options Builder to set up your own expiry times. Options Builder is an important feature to include on any binary options website since it allows you to control your trader to a higher degree. Double Up and Rollover provide you with additional control, and there is reasonable flexibility in trade sizes, which start at $5 and run as high as $2000. Other trade tools include weekly and daily market reviews, expired rates and rules, a glossary, FAQ, and basic how-to pages. This section is going to be the meat of this review, because this is where this company goes above and beyond. We’ll preface this by saying that we’ve reviewed dozens of these binary options websites to date, and only a handful of times have we ever encountered someone on the live chat service, even when we do our reviews on weekdays during normal market hours. We almost always encounter a web form and nothing else. Occasionally we’ve found chat desks staffed by robots. And even when we have encountered human beings, only on a couple occasions have they ever been helpful. Customer service can be reached via telephone, email, web form, or live chat. We are sure if you send an email, this company will actually respond to it—something else we aren’t used to. Here was our experience today. By the time you get through reading about it, we’re sure you’ll find this company as interesting as we do. There were some questions we were having a hard time answering, so we got on live chat and prepared to wait indefinitely. Instead an agent named David appeared in under a minute, and immediately asked how we were doing. Chancing that this might be a real, live human being, we said we were doing well and asked how he was doing. It turned out he was a real person. We didn’t have to wait five minutes for each response. He typed in real time and immediately knew the answers to all our questions without having to delay. Clearly, we were dealing with a knowledgeable person. This would have been going above and beyond all in itself, but David pleasantly surprised us again and helped to clarify some of our confusion surrounding binary options sites. We’ve noticed that all binary options sites look roughly the same in design, and initially believed that meant they were all owned by one company (or sold off by one company). David explained that binary options sites are mostly white label sites sold off by SpotOption, the company that created the software which powers them. He also cleared up our confusion about ChargeXP, a company which many reviewers (including us) believed owned many of these sites. ChargeXP does not own binary options sites however; it is simply a billing contractor. David explained some regulatory matters to us as well. We were blown away by his candor when he told us that the site he works for isn’t regulated, but neither is almost any other binary options site, except for Nadex. Sites which are regulated are owned by Forex brokers and regulated under other laws. The regulations framework being laid down in Cyprus and a couple other countries for binary options sites still isn’t complete. At the conclusion of our conversation, David provided us with his personal email address in case we had further questions about his site or binary options in general. Any binary options trader who has searched for information on regulations or companies knows just how challenging it can be to find clear information (or true information). And if you’ve tried contacting other binary options sites, odds are you’ve encountered the same resounding silence we so often do. If you’re tired of that kind of confusion and bad service, check out Global Trader 365. This company may be another SpotOption white label, but they seem to be trying hard to stand out from the rest and offer a better product and service than their competitors. We will be excited to see where they go with their site over the coming years. opened account in 2012 closed account in 2013 they still have allowed me to withdraw the balance 16000 i had at the time of closing. they keep changing ownership, location, etc..
am continuing my search to try and get my money from these scammers..